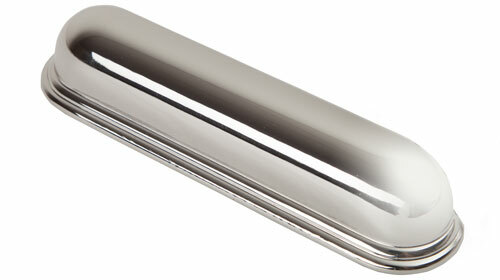 As part of the Calgary range, this polished nickel kitchen cabinet handle is no stranger to style. The high-quality nickel makes it a more sophisticated alternative to stainless steel or chrome whilst offering the same beautiful reflective quality that has become so popular within contemporary kitchen designs. Not only is the Calgary long cup handle beautiful; it is robust enough to withstand constant use. At 155mm long with almost 30mm of finger space, opening kitchen drawers is both easy and comfortable. The Calgary kitchen cabinet handle effortlessly delivers simplistic style with a modest elegance that is sure to stand the test of time.